Detroit resident Wayne Crowder was one of three individuals honored for overcoming obstacles to employment with help from JVS. 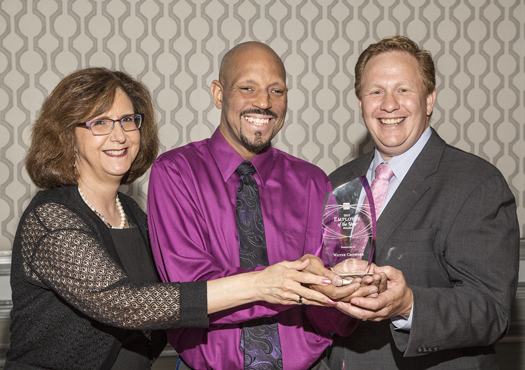 Crowder received the Employee of the Year Award on June 11 in front of a crowd of more than 700 business and community leaders at JVS’s 18th annual Strictly Business Networking and Awards Luncheon. After serving time in prison, Crowder was determined to turn his life around. But with a criminal record, he faced nearly insurmountable barriers to getting a job. “My biggest fear was being employable after receiving a federal conviction,” says Crowder. With support from JVS and funding from the United Way, Crowder took computer classes and participated in customer service training in preparation for placement in a voluntary internship with a local non-profit. “Wayne is a very intelligent guy,” says Ed Steinberger, JVS program coordinator. “But having a prison record, especially a felony, makes it very hard to get employment. He came to JVS and took advantage of every opportunity to build his skills through training programs and on-the-job experience as a voluntary intern.” Steinberger notes that the employment rate for participants in a JVS voluntary internship is close to 70 percent. During the internship with Neighborhood Legal Services Michigan (NLSM), Crowder impressed his employers. His determination and hard work resulted in a full-time job offer with NLSM in 2009. The organization offers non-criminal legal advocacy, law-related education and supportive services for individuals and families. Since then, Crowder has earned promotions and been recognized with numerous employee awards. He currently serves as case manager, providing assistance and support to families who are homeless or in jeopardy of becoming homeless. View a video of Crowder’s story at www.jvshumanservices.org/strictlybiz. In addition to Crowder, JVS honored two other individuals with Employee of the Year Awards: Suzanne Levine, executive director of Greater West Bloomfield Chamber of Commerce, and Roxann Zimmerman, greeter at the Meijer store in Northville.